Do you celebrate Christmas? If you do, why? And how do you celebrate? Is Christmas 'good for you'? What sort of presents do we give and receive and has this changed over time? 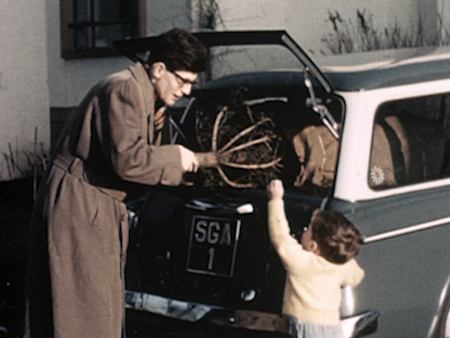 Here you can explore the customs and traditions of Christmas in the past by looking at films that date from the 1930s to the 1960s. The films show us how Christmas was celebrated in Scotland, especially by children and their families. Take a look at the toys children played with and think about the technology used to make them. This film was made by Frank Marshall (born 1896, died 1979) who was a well-known Scottish amateur filmmaker. Marshall did not start making films until he was around thirty-six, a few years after his children were born. This film features his children Muriel and Nairn. It is a story about a sister and a brother who wish for presents from Santa and attend a luxurious Christmas party, full of fun, games and food! What makes you think the Children are Scottish? How can you tell the girl doesn't want to go downstairs? Who was the shadow? How do you know this? What do you think the shadow said to the children? What would you like for Christmas? Why? With a partner, talk about your favourite toys and why you like them. Draw your partner's favourite toy and present it to the class. Are any Christian beliefs shown in the film? What customs and traditions are shown? How could we find out how people lived in the 1930s? Can you find out what they ate? Is Christmas good for your health? Why/why not? What foods were shown in the film? Are they healthy foods? Design a healthy menu for a celebration dinner or a party (write or draw). Write a script - or draw a storyboard - for the children's meeting with Santa. Include dialogue (people talking). What games do the children play? (Use the Activity Sheet to help you remember.) Play them and then add rules to make them more challenging or fun. Explore different ways of creating a shadow on the wall. What shapes can you make? Can you make your shadow move? In this film a little boy dreams about what he wants from Santa and his dream comes true! He wakes up in his own room with the toy he wished for waiting for him in his stocking. This is a clip from a longer film made by T.H. Thoms. It is a silent film so you might need to use your imagination to think about what the characters are saying. 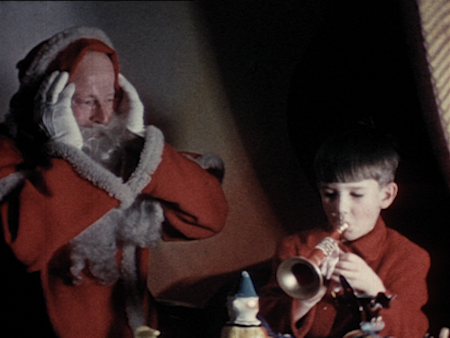 Take a good look at the choice of colour used in this film and also the range of toys at Santa's grotto. Which one would you choose? Think of some non-verbal signs hearing people use in everyday life to communicate. Find out about British sign language. What is the sign for 'Happy Christmas'? What toys can you see in the film? Make a list. What do you think the toys are made from? Can you sort them into headings (e.g. plastic, metal...)? Why are the toys made from these materials? Can you find out what toys were popular in the 1950s? Compare these to today's most popular toys. Are there any similarities? Find out what were the most popular toys in the past. Use the Activity Sheet to help you. Investigate different ways to make toys move. Investigate how wind-up toys work. Add sound to the film clip (music or speech or sound effects). Create a painting or collage inspired by the film. Use similar colours or contrasting colours. Make Christmas puppets or musical instruments using junk materials ('upcycling'). Design and make a wind-up toy or a windmill. 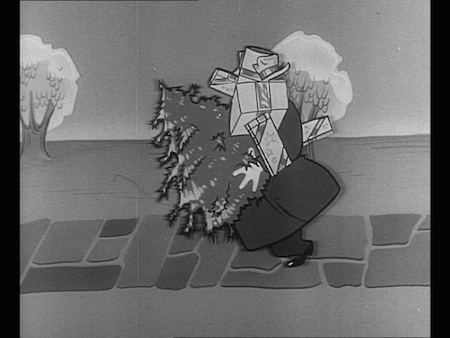 Two young children cause havoc around the Christmas tree in this funny film made by Frank Marshall. Try listening to the soundtrack without watching the images. What sort of images do you think would go well with the music? When you watch this film, think about how comedy has been created - and what keeps us watching until the end? Who do you think each present was meant for? Why? What was the funniest part of this film? Why? What do you think dad thought when he walked into the room? Do you think the filmmaker told the boys to do what they did, or did the children decide themselves? Can you find out what happened in your area in December 1957? Does Christmas in your house look like this? In what ways is your home different? Invent new uses for everyday items (e.g. toilet roll, a sock, a saucepan). Can you make a modern day version of this movie set in a school? Make a comedy Christmas card or a poster for this film. A small boy, a dog and a baby get into mischief in this film by Frank Marshall. Look out for the period details (fashion, household technology, decorations) that help to show us when the film was made. 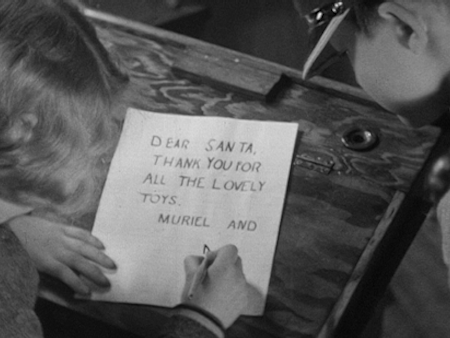 We think the mum in this film is Frank's daughter Muriel (who features in Christmas (1937)) and the children are his grandchildren. What happens in the film? Use the Activity Sheet to help you. Do you think the brother meant for the baby to get the blame for eating the biscuits? How do you know? Which tree do you think is the best (the big tree or the boy's tree)? Why? Can you find out what castor oil was used for? Find out when Christmas trees first appeared and where? Create a visual presentation or film about a custom, tradition or religious festival that is important to you. Compare the sorts of decorations used in different cultures and religions. Can you think of (and make) some environmentally friendly Christmas decorations? Draw an alternative ending to the film. Use the Activity Sheets to help you. Turn your favourite scene into a comic book strip or Christmas card design. Write a script, written from the mother's perspective, about her day looking after the children and the dog. 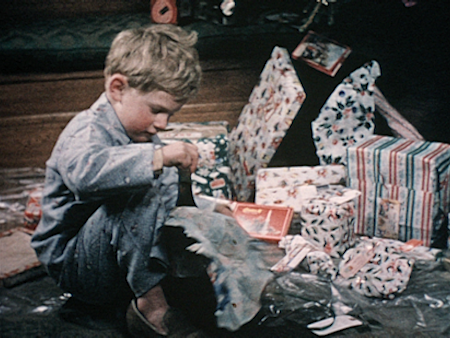 To take your Christmas project further, watch these films which show us more about Christmas in the past and the sorts of toys children used to play with in Scotland. Surprise in Store (1965) is another comedy fiction film made by Frank Marshall. It tells the story of a group of children who sneak into a department store at night and play with all the toys! Toyfair Glasgow (1971) shows the most-wanted and up-to-date toys 1971 had to offer. If you are investigating the sorts of toys people played with in the past, this STV news item is a good one to watch. Can you find someone who was a child in the 1960s or 1970s? What toys did they play with? Have you ever heard people say "Christmas is too commercial these days"? Think about the range of adverts you see in the run up to Christmas each year. Why do we see so many advertisements? How are toys and food items advertised today and how does this compare to how they were advertised in the past? Christmas 1943 shows us how important Christmas was during the Second World War and features a unique Christmas message. This advert was shown in cinemas which were the most popular form of entertainment at that time. Cinema Adverts is a collection of advertisements from the 1960s shown in cinemas at Christmastime. What can you find out about the attitudes of that decade by watching these adverts? Use our Advertising Detectives feature resource for an in-depth look at advertisements. This lesson guide was prepared by teacher Emma Cackette with support from the Scottish Screen Archive and the University of Glasgow. Created October 2014.